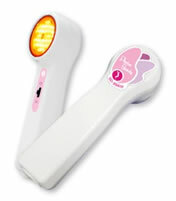 You can easily have a photon treatment very popular as one of the beauty salon treatments with this handy Photon Beauty. We use 660nm of visible ray and 850nm of invisible ray. For people who worry about wrinkles and blemishes. This product is recommended for use to people who worry about sunburn or skin dullness. Get perfect skin with LED light. We have developed this facial massager by making united use of a leading-edge LED technology and the most-advanced technology of beauty salons. Photon Beauty, an LED-light facial massager quite popular in Europe and the U.S., has finally entered the Japanese market. Photon Beauty has obtained the authentications below. Full-scale Photon esthetic treatment makes your skin refreshed. 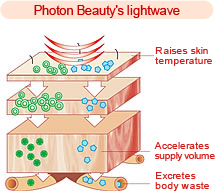 Photon (lightwave) which varies depending on your needs can directly deal with your skin problems. No need of gel or jelly makes you easily enjoy full-scale photon esthetic treatment at home. Ten times stronger light wave power!! The effects of light power. LED Photon Power as an expression of leading-edge technology of cosmetic medicine. This is an ideal LED-light facial massager recommended for use to women who worry about skin troubles such as blemish, wrinkles, acne scars.